I was recently sent a couple of clear caddies from 3Ms Command Brand to review. The idea is that they hang without the need for glue or nails (no bashed fingers - always a plus in my book!) but can be easily removed and repositioned elsewhere. The clear caddies are supplied with easy-to-hang and easy-to-remove Command Clear Strips. The new Clear Strips from Command are virtually invisible on the wall and allow you to hang the caddy without the need for nails or screws. The adhesive holds firmly and strongly in place, yet is quick and simple to remove, leaving no holes, marks, residue or stains. 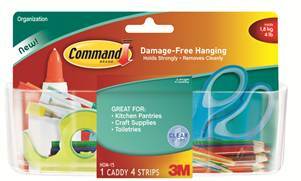 Command Clear organisation products can be hung on any painted, tiled or metal surface and because the adhesive strips can be easily and quickly removed, you can reposition your caddie whenever or wherever you need it. The smaller caddies are ideal for holding make up essentials, whilst the smart-phone holder is designed for mounting on the wall above your desk or near your charging socket and comes with a charging lead hole at the base. The larger caddies are perfect for using in the office, kitchen, playroom or bathroom and can hold up to 1.8kg or 4lbs in weight. If you prefer to keep your clutter hidden from sight, why not mount them inside a cupboard? Not being the most DIY minded of single mothers, anything that doesn't require tools has got to be worth trying. I was sent one of the larger caddies and a small caddy to try out.The caddies come with 2 sets of adhesive strips so that they can be positioned twice, but I have seen further sets available to buy in Sainsburys. Asda, Boots, B&Q, Homebase, Robert Dyas, Ryman, Staples, Tesco and WH Smith also stock them. Depending on the size of the caddy you position 1 or 2 of the strips on the back in the obviously marked places. The strips come with black on one side and blue on the other so that it is easy to work out which backing paper to take off first. Once the adhesive strips are in place you can then remove the other backing paper and then press the caddy to the wall/cupboard/fridge/boiler. I think you are supposed to wait 30 minute before actually using the caddy. To remove the caddy from the wall you pull down on the tab at the bottom of the adhesive strip whilst holding the caddy in place. You have to pull the tab down about 15 cm, so make sure you leave enough room wherever you hang it. This is the bit where you have to hold on to the caddy because otherwise, when it releases, it pings off and you can end up with bashed fingers! Although it says on the instructions not to hang on wallpaper, I did try this out on wallpaper (my kitchen needs redecorating anyway!) and I was very impressed when the caddy came off clean as a whistle, leaving no marks, and leaving all of the paint and paper on the wall.I was a bit puzzled though, as to what I was actually going to use them for. The small one works as a phone or pen holder - I stuck mine next to my calendar so I'd always have a pen to hand. The bigger one I wasn't so sure about. The packaging shows the caddy holding nail polish, but I have rather a large collection (500+?) so there's no way I could fit THAT in there. Then inspiration struck! 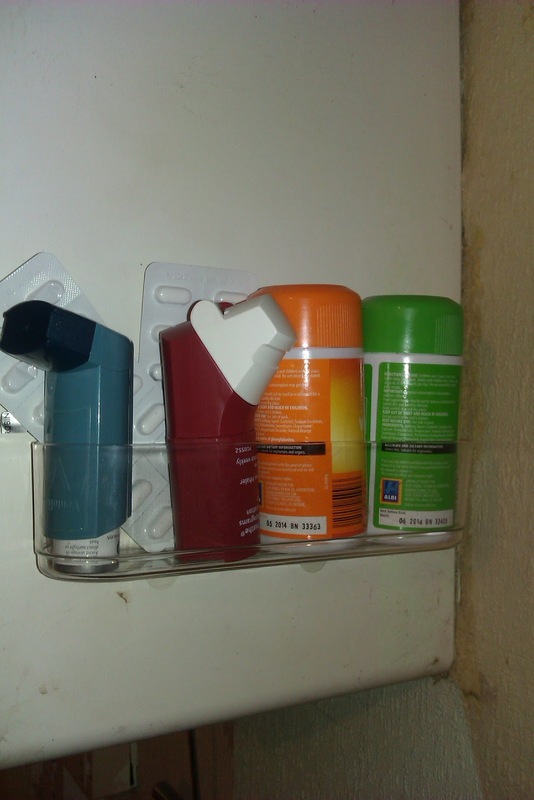 I struggle to keep my tablets and inhaler close at hand so I don't forget to use them, whilst keeping them out of the way of small people. And when those small people aren't so small and are climbers that is not easy to do! So I stuck the large caddy onto the side of my boiler and put those necessary items in it - apparently not such a bright idea as it gets hot and probably not the best thing to have my inhaler next to, as my mum kindly pointed out! But at least they are handy and out of the way, and, with the second set of strips I can always stick it somewhere else. Ok, so may be boiler wasn't the best idea! So this product gets a double thumbs up from me and I would definitely recommend it to other tool shy people like myself!